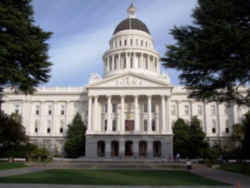 Take a peek at California history. Discover an overview of California's rich history, heritage, historic events, and culture. Four flags have flown in earnest over California: Russia; Spain; Mexico; and the United States. 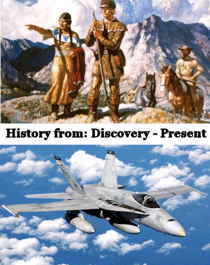 The first settlers to arrive in California after the Native Americans were Spanish, and later Mexican. Spaniard Hernando de Soto, in 1541, was among the early European explorers to visit the territory, but it was a Frenchman, Henri de Tonti, who in 1686 founded the first permanent white settlement - the Arkansas Post. Russia had some small settlements for the purpose of whaling and fur trapping in Northern California, but Russia didn't attempt to colonize the area except in very isolated areas. Spanish priests were sent to California to covert the Indians to Christianity. Spain hoped to make the California native population into good Spaniards, loyal to Spain. Spain was becoming alarmed that the Russians and English were encroaching on lands claimed by Spain. The fight for California began almost 500 years ago with Queen Elizabeth I. She sent Sir Francis Drake to harass and raid the Spanish galleons. England was beginning to realize the value of California. England did not want Spain claiming more land in the new world, upsetting the balance of power between the super powers of the time. Tensions were already high between Spain and England. Henry VIII, Elizabeth's father, had divorced his first wife, Catherine of Aragon, a Spanish princess. In order to accomplish the divorce, England severed ties with Catholicism and Henry had instituted protestantism as the State religion. Henry and Jane Seymore's son had assumed the throne after Henry's death and continued Henry's policies. But when Edward the IV died at the age of 16, Mary I came to the throne. She was the daughter of Henry and his first wife, Catherine. Her ties to both Spain and Catholicism were strong. Elizabeth was suspected of plotting to overthrow Mary and was imprisoned in the Tower. After "bloody Mary" died and Elizabeth I became monarch, the power struggle between catholics and protestants did not end. Eventually, Elizabeth had Mary, Queen of Scots, executed for treason. Mary was her greatest threat to the throne since Mary claimed it as her right by way of England's ties with the French throne. Even though Mary had abdicated her rights, she still remained a threat to Elizabeth since Spain and France could use Mary as a cause to move against England. With the death of Mary Queen of Scots, England had secured protestantism and Elizabeth's reign, but was short on allies. In order to build new European allies, England had to remain a power to be reckoned with. Spanish settlement along the west coast of North America could bolster Spanish power. This was the last thing England wanted. 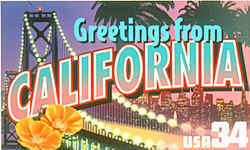 California had come from obscurity to statehood because of the Gold Rush which started in earnest in 1849. Even though California was now part of the United States, coming to California was no small feat. If settlers on wagon trains made it over the Rockies safely, they were often stopped by the hostile Sierra Nevadas. Winter comes early and savagely and many settlers lost their lives like the Donner party. Prior to the Gold Rush, settlers very slowly filtered into California until 1848 when gold was discovered at Sutter's Mill. Suddenly, people from all over the world looking to strike it rich flooded through San Francisco. They travelled up the Sacramento River to the gold fields. The Gold Rush was devastating to the Native Americans in the area and depleted many natural resources. What is now San Francisco was once a redwood forest. Whole native tribes were scattered or destroyed. In some areas there were bounties on Indians. The California tribes still have a rich culture and heritage, but the nineteenth century was a period of great loss for all native tribes in the area. The next several decades were marked by the development of the cotton industry and the spread of the Southern plantation system west into Arkansas. Arkansas joined the Confederacy in 1861, but from 1863 the northern part of the state was occupied by Union troops. California had become part of the life of the United States in the middle of the nineteenth century--an exotic land of untold promise on the distant Pacific Coast. At the beginning of the twentieth century, California seemed less exotic, and the land's promises seemed more limited. And these developments resulted from many factors other than the end of the rush for gold and easy mineral wealth. Much of California's mystery arose from the state's geographical position, a region facing squarely west across the Pacific, with its mountainous "back" turned to the rest of the nation. By 1900, American settlement had filled in the pockets of unmapped land in the Far West. Washington State and Oregon were admitted to the Union, and the Pacific Coast was occupied by three states running south from Canada to Mexico. While a few territories remained to be organized into full-fledged states, the United States could now be truly said to extend from the Atlantic to the Pacific. And Alaska, far to the North on the Pacific Coast, had replaced California as a mysterious frontier land with riches of gold. Further, the Pacific and the lands west of California were becoming more fully a part of the life of the United States. Trade to Japan and China had been opened in the second half of the nineteenth century. Chinese immigrants and their descendants, once confined entirely to California, were slowly beginning to create "Chinatowns" in cities further east. Even more important, the United States was assuming responsibility for the government of more and more Asian peoples across that Pacific. The Spanish American War of 1898 left the United States as the custodian of the Philippine Islands. And in 1900, Hawaii, whose population included native tribes and descendants of immigrants from many Asian nations, became the United States' last organized territory. The increased importance of Asia and Asian affairs for the United States was recognized when President Theodore Roosevelt played a key role in mediating the end of a war between Russia and Japan in 1905. If California had lost much its special nature as America's outpost on the Pacific, the new century also reminded observers around the world that California could no longer be regarded as an uncomplicated paradise of easy living. This lesson was brought home with terrible force on the morning of April 18, 1906, when an earthquake shook the proud city of San Francisco for two full minutes. The quake and the fires that followed for three days left 500 San Franciscans dead and destroyed more than 28,000 buildings--more than a third of the homes, offices, and stores in the entire city. Although damage was greatest in San Francisco, its effects were felt in every city from San Juan Bautista to the coast at Mendocino. San Francisco would be rebuilt, and Californians would learn to construct homes and stores that could better withstand future disasters. But no one could afford to forget what had happened that week in April, and no one could pretend that California's bountiful natural resources somehow made the state or its residents immune to nature's equally generous capacity to destroy. California faced the new century with a new maturity and sense of reality earned at a terrible cause. Among the states, California has the largest number of senior citizens living within its borders. More than four million residents are more than 60 years of age.